The last of the heavy hitters is late to the party, but at least they've finally showed up. Ladies and Gentlemen, might I introduce the Mercedes W03! Apparently, Merc is kinda cheating just a little bit on the platypus. Only the outside edges of the bump are at the legal height... which fits the letter of the law, if perhaps not the spirit. Since this is F1, it's already been declared legal. Small sidepods, small radiator intakes, not much of an undercut, a pair of extra intakes just behind the airbox... and oh my gawd the platypus looks completely hideous on the W03. Ross Brawn hisownself came out and said that the nose design "is certainly an acquired taste." So is the barrel of a shotgun. The team says that there's 4500 parts to the W03, up 200 from last year's car. They say that like it's a good thing, but isn't that 200 more things that can go wrong? I dunno; Merc is saying that they're going to make a run at the championship this year, and more power to them. But I just don't see it happening. They've been 4th the past two years, and while I'd love to see them jump Ferrari, McLaren and Red Bull, it seems like a stretch. But then, they were once known as Brawn GP... and we all know what happened there. 1 I wonder if you could legally spread the "bump" part of the nose out to the sides and leave the middle part low, forming a "V" shape. It might make some aerodynamic sense, and would certainly LOOK much better, while still serving the purpose of having a high nose for safety purposes. The "W-duct" that Mercedes is playing with certainly looks interesting. Apparently they've got ducts going from that hole in the nose and running out to various points all over the forward wing. There's also apparently a redirector of some sort in the nose behind the vent that manages how much air goes out which duct depending on whether the car is going straight, right, or left. It doesn't seem like you'd get enough intake air for it to make a difference, but presumably they've tested it and think it's worth the effort. Sir Frank's team is one of a regal history having fallen on hard times of late. The team has been around for 35 years, and is one of F1's historical "Big Four" teams (with Ferrari, McLaren and Renault). In the time I've been an active fan of the sport, however, they team has, at best, just been okay... and at worst, they've been bad. So will a return to Renault engines, paired with the new FW34 chassis bring a return to prominence? No less an individual than Sir Frank Williams hisownbadself has said that the new car has less than 5% parts in common with last year's FW33. In some ways, this is good: that car was a dog. It's also quite the risk, as F1 teams have historically found that evolution, not revolution, is the way to success. Again, though, the 2011 car was just bad and there probably wasn't all that much worth keeping. Having said all that... the Williams' paint job is terrible for seeing details. The platypus step looks like it's a vertical wall. It's not, but that's the way it looks. Big air intakes, maybe the largest we've seen so far. I'm amused by the Gillette sponsorship on the multi-level front wings... ladies and gentlemen, the twin-bladed razor of F1 cars! Wacky rear wing! The sidepods are small-ish, but nicely shaped. No undercut on them at all though. I HATE the the "flying" fin on the airbox. I'm sure it's aerodynamic, but I just don't like it. I'm kinda struggling for stuff to talk about with this car. Of course, I've talked about what, six or seven others already? I've lowered the contrast by 50%, I've boosted the brightness by 30%, and increased the saturation, and the car still looks like it's sucking in all light within 20 feet. Ugly nose. Having said all that, I really hope there's some speed in this chassis. Formula 1 would be much better off with Williams being good. I'll admit it: I got nuthin' here. The team sounds like they're excited about the FW34, but they would do, wouldn't they? On the other hand, I can't get excited about it. If everything goes right, does anybody realistically see them finishing any better than 5th in the constructors? 1 Rainy races are going to be a problem. OTOH, your description reminds me of Disaster Area's stunt ship. Being almost completely friction-less would certainly help performance. 2 You would think so, but would it not actually hinder performance? After all, with no friction you have no grip, and therefore no handling or acceleration. My god... HRT has a frictionless car! While the boys from Milton Keynes debuted their 2012 challenger yesterday, it wasn't much of a much. Instead of actually showing the car in any way, they released a couple of renders and a crappy video. However, with today being the start of Winter Testing in Jerez, Spain, we got to REALLY see the RB8 for the first time today. Or, at least, we did once it finally took to the track some four hours late. Seems the delivery of some important part of the car was delayed by fog at the airport. Whoopsie. Well, that's different. Red Bull's solution to the platypus nose is to hollow it out... which makes sense, once you think about it. That vent is certainly being used to cool the driver, the electronics, or both. It probably does away with a lot of the drag caused by the stairstep, too... or at least removes much of the disturbed airflow from where it'd do the most damage, aerodynamically. The sidepod inlets are smaller in comparison to last year's runaway winner, though not dramatically so. In fact, there aren't all that many changes from the RB7 (above, bottom). I mean, beyond the obvious platypus nose. The airbox cover doesn't have the thin fin any longer and the verticals on the rear wing are now square with dangling "fingers", as opposed to the curved cut of last year's car. The sidepods don't look as high, but they also don't seem to slope down as far. So, not many obvious changes, but that shouldn't be a surprise... I mean, it's not like the RB7 wasn't the best car around in 2011 or anything. As I mentioned last year, any changes are probably under the skin. After looking at the slot in the nose, I think we've finally figured out where Mark Webber and Seb Vettel have to slide their timecards. That nose might just be the worst of the bunch... what is it that it reminds me of? Oh... oh yeah, I've got it. 1 And these days it seems as if their exhaust systems are also as baroque as the one on Akagi. It's been a busy couple of days in the F1 rollout season! Four teams brought out their 2012 challengers... and only one of them, Sauber, released glamour shots of their car. So for a F1 MegaPr0n, we only have a few workable pictures, and there's only one angle that all three of the teams in this MegaPr0n used. Fortunately, it's the three-quarters angle, which is the most useful for our purposes. Ladies and gentlemen, the first ever F1 mini-MegaPr0n! First up, Renault Lotus! Proof that it's possible to make a good looking platypus nosed F1 car. Of course, this isn't surprising, because the Renault Lotus E20 appears to be last year's Renault Renault! It appears that the team had to do quite a bit of engineering work to re-route the forward facing exhaust system to meet the tech regs, and as a result development on the rest of the car stagnated. The platypus nose is nothing particularly difficult to accomplish, obviously. However, Renault Lotus actually managed to make this one look good... or at least, not as awful as all the others. It's not the hideous ramp that Ferrari has, nor is it the "hills and valley" used by the other teams. Other than those changes, though, it really is the Renault Renault R31, all over again. That may not be a horrible thing. Like Renault Lotus, Sauber's C31 seems to be a C30 in 2012 regulations, there are a few changes. Obviously the platypus nose is present... but the hump has a trick involved. There's a thin gap where the nosecone meets the hump, apparently an attempt to disrupt a little bit of the drag that'll undoubtedly be created by the thing. Will it work? Who knows? Other changes are a touch more subtle. The sidepods, which were already cut down last year, have been even smaller and more rounded. The top of the car from the cockpit to the front tires is flat; last year it actually was angled up from the cockpit to the tires. The whole chassis is very clean, almost austere in looks. I rather like it. The biggest change, though, is the addition of Oerlikon as a sponsor. Does this mean there's a 20mm autocannon hidden in the airbox? Toro Rosso's STR7 has a "hills-and-valley" approach to the platypus, which is as good as any, I suppose. I suppose it's boring to say that it's very similar to last year's STR6, so I won't... though it is. The sidepods are shorter and more deeply cut than those on last year's car, which should remove quite a bit of parasitic drag from the chassis. The airbox has an interesting support arrangement to it now, and under the main intake, there's a second intake, presumably for cooling the KERS unit. Something that isn't particularly visible in the pictures of the cars rolled out to date is the position of the exhausts. Toro Rosso's is set about as far back as they can legally go, and their position seems to be blowing right onto the rear wing. "We can't use a blown diffuser, but nobody said anything about a blown rear wing," seems to be the plan. Now, sharp-eyed readers might have noticed that I said that there had been FOUR rollouts over the past two days, yet I've only shown three. That's because the fourth team was Red Bull, and all they let us see were a couple of cheap renders of the car they'll be defending their title with. With the first offseason practice session beginning on Tuesday, I expect we'll be seeing a little more than that tomorrow, so I'll hit it and Williams then! Post contains 691 words, total size 5 kb. 1 A couple of cheap renders and a dark, low-resolution video produced by hipster marketing robots! *Sigh* I guess I can wait one more day to hear your thoughts on The Thing From Milton Keynes. It sure is... something. 2 Pullrod rear suspension seems to dominate. You know something's kinda wrong when no less a light than Stefano Domenicali, team principal for Scuderia Ferrari, comes out and publicly says "Well, actually, it’s not really so pretty from my personal perspective. But this is a value that doesn’t count in Formula 1... ...as our chairman has already said the fact that it is ugly or very nice doesn’t count a lot. The most important thing is that the car has to be performing." In other words, "winning fixes ugly." Having said that, Ferrari better win a lot of races this season, because the new F2012 is a lot of ugly. Though to be honest, from the front it looks not so bad at all. 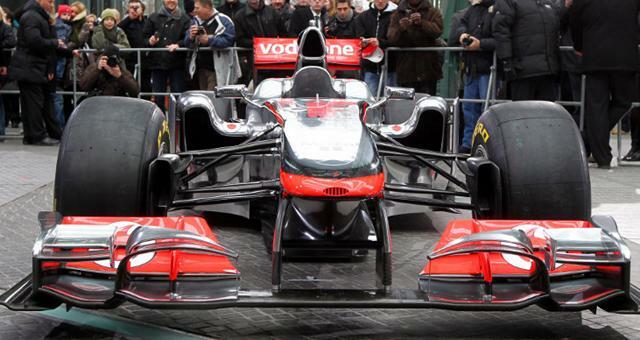 The front wing is supposedly evolved from the flexi-bendy wing they ran at the end of the 2011 season. For their sake, I hope they got the "oscillating like a USGS seismometer in a magnitude 9.5 earthquake" feature fixed. There were times when I wondered how the Red cars were able to stay on the track, even going in a straight line, because of that wing flapping like an ornithopter. From the side, it still doesn't look so bad. Like the McLaren, there appears to be an angle (back-to-front) to the floor. The sidepods are deeply undercut, more like the Force India than the McLaren, though not the same sort of profile. Amazing how so many teams can do the same thing, but come up with completely different designs. It'll be interesting to see which one comes off the best. One thing that comes back from past designs is the weird double rear bodywork thingy on the engine cover. I've never been fond of that design element, and it doesn't look any better here. It looks like the engine cover came off the sprue badly and nobody bothered to trim the flash off. ...and now the hideousness of the nose becomes apparent. Yeesh... if anything, it may be worse than the Lotus Caterham and the Force India solutions. However, this does raise an interesting question: just how did McLaren's nose fit under the technical regulations while a team like Ferrari does... this? Interesting that there's another fin between the front wheels; haven't seen that before, have we? According to the team, the car is almost all brand new, with very little coming over from the F150° Italia. I gather the rear wing is pretty much the same, with just some very minor tweaking. I'm pretty sure they trucked it to the track. I mean, could you imagine driving a F1 car... in the snow... on slicks? I suspect the car would be in the wall, on its back, and on fire, within a few feet. Renault Lotus is next up on Sunday, followed by a F1 MegaPr0n on Monday, when Sauber, Toro Rosso, and defending constructor's champion Red Bull all roll out. See ya then! 1 What's that thing on top of the air scoop? Force India has that, too, but McLaren doesn't. 2 > I suspect the car would be in the wall, on its back, and on fire, within a few feet. Steven I think you are referring to the T-Bar? As far as I know it's a standardized FIA-mandated thingie to hold the on-board camera. McLaren will have one too when they go to race; the car as unveiled has a bump where the standard T-Bar will eventually mount. That nose bump is horrifying. Caterham and Force India have a sculpted channel down the middle of their bumps, but the Ferrari just has a big honking ramp right there across the nose. I can't wait to see what Red Bull does this year. If Newey doesn't go for the bump, I think the other teams are going to be second-guessing themselves. 3 As FDM says, the T-Bar is a required camera mount, designed to be aerodynamically neutral. Every car has one, even if (like McLaren) they don't have it in the glamour shots. It's usually the easiest way to recognize which driver's car you're looking at, too; the "team leader" had a red t-bar, the "second driver" a yellow one. 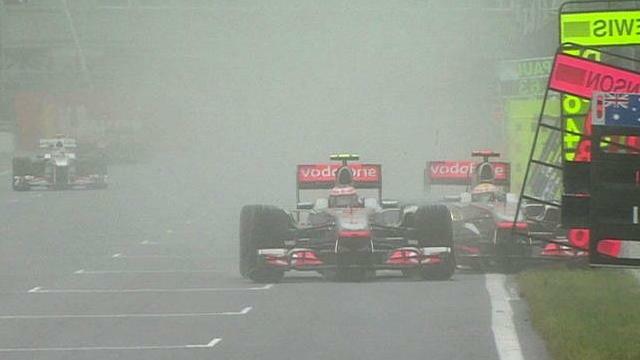 For example, please see this picture from the 2011 GP of Canada, with Jenson Button (yellow) and Lewis Hamilton (red). There are usually a few other camera points on the car; the FIA will choose more-or-less at random what car gets what camera at what location. If you look at this picture, you'll see a camera mounted just forward of the front-right suspension. 4 That thing looks like a major source of drag and turbulence, but if everyone has one then of course it's equal. A old axiom in aircraft design is if it looks right it will fly right. Witness the Lockheed & Boeing battle with the F35 looking right and winning the contract. I must say the cars so far are a disappointment except for McLaren, it does has some style and grace. I wonder if the FIA set this up to discommode Darth Bernie as I'm sure the fans will hate how Ferrari especially looks. A old axiom in aircraft design is if it looks right it will fly right. It's also bogus. The Brewster Buffalo looked good, but got slaughtered in the air. On the other hand, the P-38 looked awful, but flew really well. 7 I'd argue that the Buffalo looked more like a beer keg with wings, but agree with you about everything else. I've heard the axiom used in regards to aircraft, ships, cars, you name it, and for every time it's been true, there's a HMS Hood or Fairey Gannet. One should not read anything into the fact that I chose two pieces of British equipment. 9 The unique pullrod-type FRONT suspension is explained by Mr. Fry as having center of gravity benefits. I suppose it makes some sense, if you have the place where to put the driver's legs. We've had two rollouts to date, and the score is one normal nose (MP4-27), one platypus nose (CT01). The question is, which way would Force India's fifth design, the VJM05, go? Platypus. Definitely platypus. The people who know these things say that Force India used the same wing for two years, with the team issuing upgrades and developments at various points over those seasons. It appears that the VJM05 is rockin' a new, more complex, front wing that some suggest will be flexi-bendy, like the Red Bull's. If they can pull that off, it'll be a major coup. Remember, Ferrari couldn't make it work, ending up with something that flapped like a hummingbird's wing. This had a rather unfortunate effect on the structural stability of the car. The sidepods are longer than the McLaren's, but seem to have a bigger undercut to them. Other than that, the chassis seems to be fairly conventional. Smooth airbox. The platypus nose looks hideous in this picture. Unlike the CT01, this one has a rounded nose, again similar in appearance to the Red Bull designs. 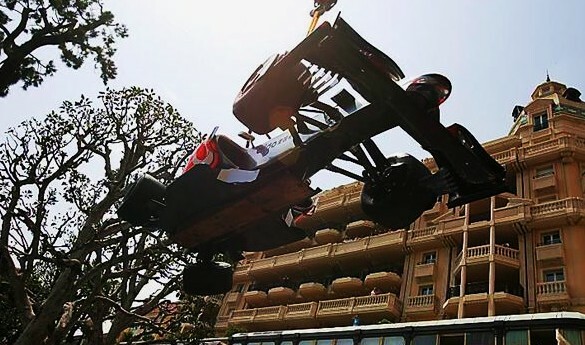 Though we can't see it in these shots, I gather that the underside of the nose is also rounded, better to shed air in the direction of the underside of the car and increasing the downforce. The, for lack of a better term, "barge boards" just to the outside of the sidepods seem much more prominent than they do on the other two chassis that have been rolled out thus far. I'm sure they're perfectly legal, but I'll be switched if I like 'em. The nicest rule change in the past five years was the one that got rid of the proliferation of such things; these bring back unpleasant memories. I suspect this is a make-or-break season for Vijay Mallya's team. It's been five years without a win, only one podium and just one pole, both of which look like flukes. There are reports that Mallya's financial empire is showing cracks; Kingfisher Airlines paid their salaried employees late four months running, for example. If this is truly the case, one could reasonably assume that F1 would prove to be something totally disposable... unless good things start happening in a hurry. We'll see how the VJM05 does down the road! Ferrari's rollout will be covered tonight. McLaren has always seemed to have been of two minds when it comes to their F1 cars. Either they're a little boring or they're completely goofball. Last year's MP4-26 went full goofball, what with the L-shaped air intakes on the sidepods and all. For 2012, it looks like the team from Woking has gone button-down collar and pocket protector on us. Ladies and gentlemen, the MP4-27. The first thing that leaps out at you is... the more or less normal looking nose. As we'll see in the next picture, all is not as it appears, though in comparison to the Lotus Caterham, it's boring. The air intakes on the sidepods are back to something a little more staid than last year, though they are somewhat... elongated. The section directly under the nose is a little busier than last year. The rear wing of the new car also has... fingers at the bottom of the rear wing assembly. These started to appear on the cars last season, and I'm sure there's something good aerodynamically involved with them, but I'll be switched if I can figure out what it is. I'm not the big brain though, as anybody who's read The Pond could attest to. No matter how fast the MP4-27 goes, there is one thing you can say about it: it sure is purty. I think they need to go back to the silver rims though. The black just doesn't work. Now for the best thing of them all: the annual McLaren centerfold! Just click "more" for some sweet sweet Glare On Wheels action, sans staples! 1 Compared to last year, the top scoop is different. It looks smoother, more streamlined. 2 Also, is it a camera angle thing, or does it look like the bottom runs higher than last year? Looks like there's more clearance beneath the car. 3 I think you're right, Steven... I didn't even notice that. 4 Yeah, the secondary intakes on the airbox are gone. I think the clearance thing is a camera angle effect; compare the plane of the tops of the front tires and you can tell that the shots are from different heights. Not only are the sidepods very sculpted, it looks like the airbox also tapers more quickly down at the rear. 5 Much nicer than the platyrham. Hopefully more of the field can make a good looking car within the current regulations. It does look like the front wing is farther from the ground on this car than last year, but when you account for the viewing angle the front of the under-tray appears to be at pretty close to the same height. And isn't the front wing height something that's adjustable? Certainly the teams change their nose around lot, so it could just be that they've got a nose designed for a different track on. 48kb generated in CPU 0.05, elapsed 0.2011 seconds. 50 queries taking 0.1552 seconds, 140 records returned.